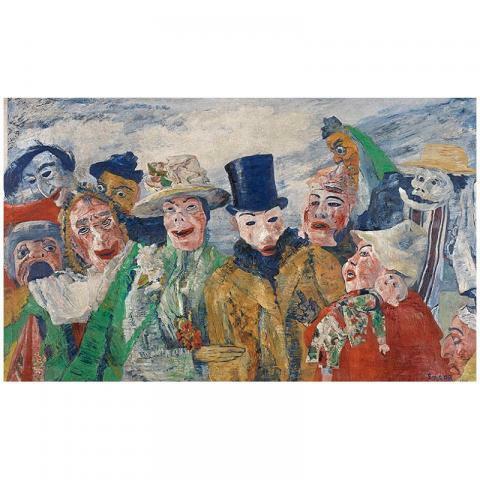 James Ensor (1860-1949) was a visionary artist whose whimsical, fantastical, ironic, and occasionally aggressive oeuvre strongly influenced the art of the twentieth century. The extensive retrospective at the Kunstmuseum Basel is based on the holdings of the Royal Museum of Fine Arts Antwerp, which has the world's largest and most important collection of Ensor's works, complemented by important works from Swiss collections. The show features representative selections both from the less well-known early oeuvre and from the period of the famous mask paintings as well as the late oeuvre, which has recently been the focus of renewed scholarly interest. With around fifty paintings, a similar number of drawings, and prints, the exhibition presents a comprehensive panorama of Ensor's eminent oeuvre, which continues to inspire artists. Masks, phantoms, skulls, skeletons, and other macabre characters gathered in bizarre situations: the work of the Belgian artist James Ensor is whimsical, fantastical, ironic, occasionally aggressive, but also suffused with a profound sense of humor. His offbeat and baffling motifs, which highlight the absurdity of human existence, inspired artists like Alfred Kubin, Paul Klee, and the German expressionists Emil Nolde and Ernst Ludwig Kirchner as well as the Surrealists, who claimed Ensor as their ancestor. The artist himself thought that his multifaceted oeuvre "anticipated all modern movements ... in all directions." becomes the defining characteristic of his art. He stages European carnival masks as well as Asian masks of various provenance in bizarre settings. The Royal Museum of Fine Arts Antwerp is closed for renovations for several years, creating an opportunity to bring the entire Antwerp painting collection to Basel. The exhibition at the Kunstmuseum Basel includes around fifty paintings and as many drawings, some of which have never been on public display, and complements the Antwerp collection with paintings from Swiss collections (some of these works have not been shown in more than seventy years) and prints from the Kunstmuseum Basel's Department of Prints and Drawings. In collaboration with Fondation Beyeler and the Department of Art History at the University of Basel.